Fashion Designer Jenni Kayne shows us how to throw the perfect Valentine's Day cocktail party whether you are single or not. For Valentine's Day this year, we hosted a small get-together with family and close friends. The evening featured simple, sweet touches (and even sweeter desserts) for a laid-back gathering that felt like the perfect way to celebrate the holiday. 1. To set the tone, I placed flax linen runners from Libeco across the table, and on top, votives from Atwater Pottery. At each setting, I used my French Gray Heath plates, David MellorPride Cutlery, soft pink tumblers from Nouvel Studios, and pink Auntie Oti napkins that I found at Nickey Kehoe, secured with rope napkin rings from Garde. 2. The amazing ladies of Botany created all of the florals for the evening, including a gorgeous arrangement of ranunculus, anemones, Juliet and Patience garden roses, Lady Slipper orchids, pieris, plumosa, and geranium that my father sent to me. For the dining table, they filled Tulia bud vases with ranunculus, sweet peas, raspberries, hellebores, maidenhair fern, geranium leaves and mint, and tucked blooming jasmine into the napkins at each place setting. 3. The evening featured sweet and savory bites, including a cheese plate served on one of my favorite Edward Wohl cutting boards, accompanied by a vintage piece of pottery that served as a bud vase, and two pink beech wood bowls that I found at Twig & Twine. 4. 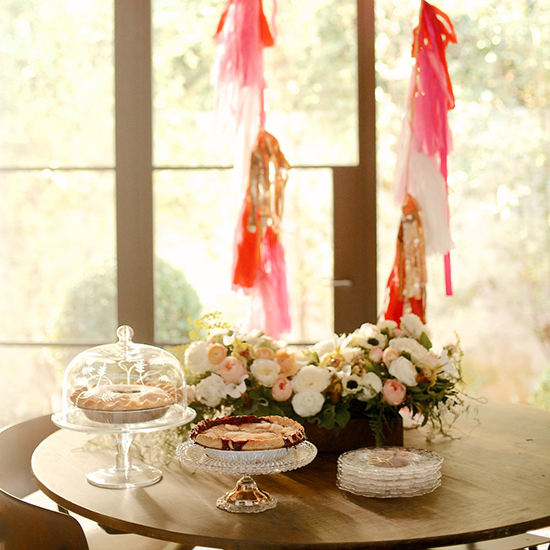 For our dessert table—which featured Valerie Gordon’s beyond delicious Valentine's Pie(picked up at her Echo Park storefront in Los Angeles) and a new favorite, Strawberry Rhubarb Crumble Pie, from Good Eggs—we kept with the simply sweet décor. We displayed the pies using a William Yeoward cake stand with cover from Geary’s Beverly Hills, and a vintage etched glass stand that I borrowed from my mom. And for serving plates: matching etched glass plates. 5. Lastly, we added festive touches using enormous balloons with tassels from Fire & Creme—I send balloons to my kids every year for Valentine's Day—and heart sparklers from Jonathan Wright, which we placed in the desserts that finished off the meal. 6. Lastly, we added festive touches using enormous balloons with tassels from Fire & Creme—I send balloons to my kids every year for Valentine's Day—and heart sparklers from Jonathan Wright, which we placed in the desserts that finished off the meal. Visit Rip + Tan to see more details from Kayne's picture-perfect party!